Bengaluru: With thousands of people taking to the streets to protest against the Central government for its economic policies, the regular commuters had to pay the price as the rallies and protests threw the vehicular traffic out of gear especially near Town Hall, City Market flyover and Freedom Park in the central business district (CBD). Central Trade Unions (CTUs) have called for a two-day all-India bandh on January 8 and 9. Urban experts and politicians felt that such rallies and protests in Bengaluru should be avoided. They said instead of protests, issues should be debated in a much better way to find solutions. Venkatesh, a motorist who travels from Wilson Garden to Majestic, said he was stuck for over 20 minutes at JC Road as the trade unions took out rallies from Town Hall to Freedom Park. "This place should have a limit of public movement during such protests. The agitation spills over to the city’s roads leading to traffic chaos," he said. V Ravichander, urban expert, said, “At a time when our economy is bad such protest is not meaningful as it has an impact on daily wage workers. The protest is democratic and it is a matter of right but now, Bengaluru with such a huge human and vehicular population it cannot bear such rallies and protests." BJP MLC Ashwathnarayana, who condemned the protests against Central government by the trade unions, said it was a state-sponsored bandh. 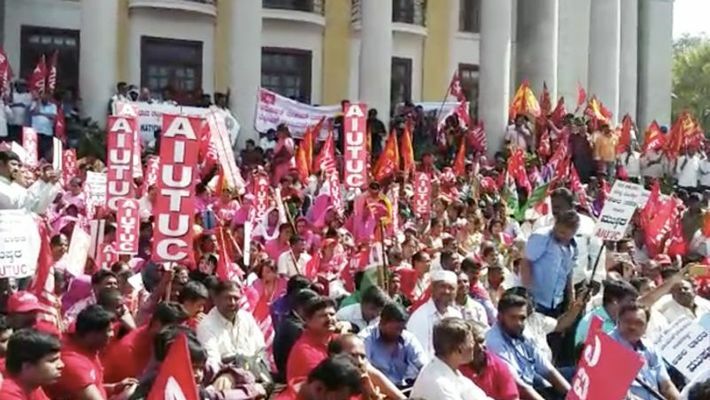 "The agitators are the supporters of the state government and to prove that the bandh is successful they held the city roads and public to ransom," said Ashwathnarayana.